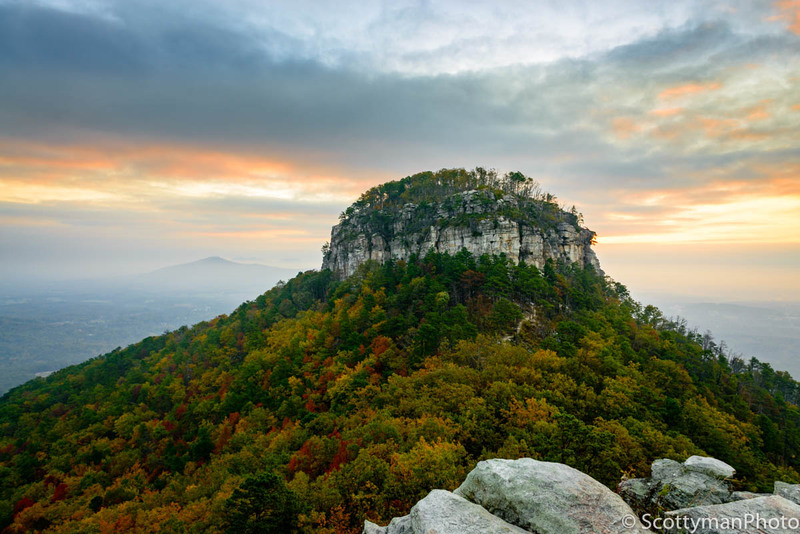 A fantastic image captured on an autumn morning at Pilot Mountain State Park in North Carolina. Captured: October 16, 2016 @ 7:41 a.m.
Visit Pilot Mountain State Park and enjoy stunning photography coupled with great hiking, camping, and more. This unique and breathtaking location is a must-see for any serious photographer or outdoors enthusiast. Additionally, enjoy my travel photography tips and advice while preparing to visit this unique and beautiful vista. The story of Pilot Mountain. Conveniently located and easily accessible from US-52, Pilot Mountain is more than 2400 feet above sea level peaking above its neighbors at approximately 1400 feet and is visible for miles from Highway 52. This fantastic spectacle has served as a navigational landmark for hundreds of years. Although connected, the Mountain consists of two pinnacles. Visible from the main highway, the first is Big Pinnacle, the highest point with the peak of the mountain exposing bare rock walls with a tree covered summit. The second is Little Pinnacle, located just below Big Pinnacle providing a large open area for tourist, hiker, and photographers to observe and photograph the mountain. The image above was captured from the perspective of Little Pinnacle. Pilot Mountain is the home of countless trails and endless opportunities to capture an fantastic open vista. Camping is also available in designated areas. Additionally, if so inclined, a skilled climber may opt to scale to the summit of Pilot Mountain to capture a rare and stunning vista. Take a moment and tour my other images of Pilot Mountain. Visit my gallery on Fine Art America. Due to the remote location and long ascent to the top Pilot Mountain, I feel many photographers tend to steer away from this unique marvel of nature. Remotely located, Pilot Mountain offers a connection with nature far from the typical noisy city. The vantage point on the mountain provides a broad range of perspectives of the surrounding area. On a clear day, one can see miles into the beautiful green hills of North Carolina. Indeed a photographers paradise, Pilot Mountain is a great location to get away from the noisy, busy life of a typical city and reconnect with nature. Pilot Mountain is a fantastic place for any landscape photographer and provides an excellent scenic background for a variety of photography goals, such as weddings, family, or other portraits. Many interesting subjects to photograph. From an impressive open vista of Pilot Mountain to the many close-up snapshots of a variety of plants and trees, there’s an image for any photographer. One of the most attractive features of Pilot Mountain is the many interesting foregrounds to compliment any composition. Visit my work of Pilot Mountain at scottymanphoto.pixels.com for a few ideas before your stay. Also, in addition to capturing a grand vista of the summit of Pilot Mountain, one can depart Little Pinnacle and move in for a close-up of the mountains rocky edge with a quick hike to Big Pinnacle via a convenient trail that leads entirely around the mountain. The path is not difficult to trek, so grab your camera and enjoy the breathtaking views along the way. Fortunately, restroom facilities are available at Little Pinnacle near the parking area; however, these are the only restroom on the mountain, other than in the camping areas. Unfortunately, the Pilot Mountain currently has no food or vending machines. If you plan on staying awhile, you may also want to consider packing a snack. Pilot Mountain offers a variety of hiking trails ranging from a short and easy hike to a long and semi-arduous trek. As a passionate travel photographer, nothing beats a brisk morning or evening walk in transit to a new magnificent landscape. In addition to hiking, horseback riding is permissible on specific trails. Camping on the mountain is available! From tents to campers, one can enjoy the many views and activities of Pilot Mountain while conveniently camping on location. Bathrooms, showers, drinking water, electricity and other amenities are available at the campsites. Click the link to check with the park services for specific camping requirements. 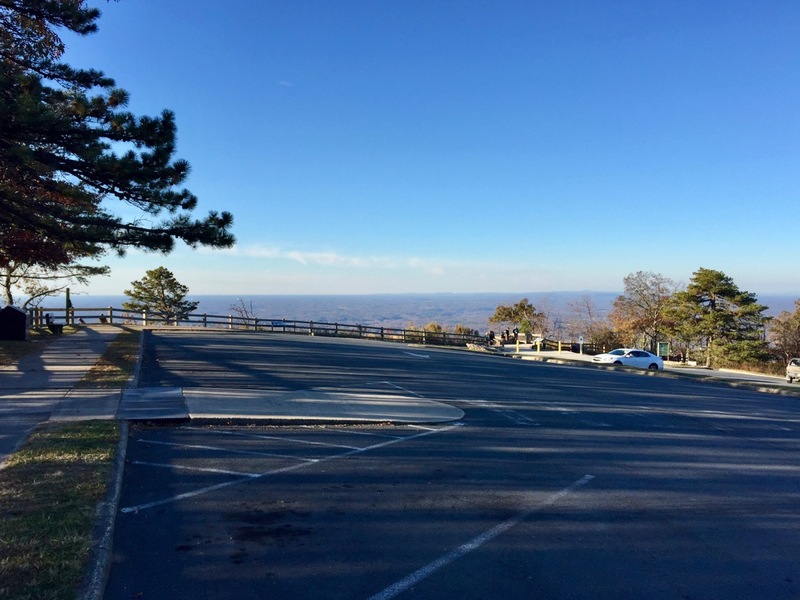 Other than local camping on the mountain itself, only one or two hotels are available in the immediate vicinity; however, a few RV parks are in proximity to Pilot Mountain. Additionally, a variety of hotels can be booked in the nearby city of Mt. Airy, NC. Approximately 20 minutes away, excluding the transit time to and from the parking area of Pilot Mountain, Mt. Airy also includes several great restaurants and other amenities. Barring cold weather and heavy snow in the winter months, Pilot Mountain is ideal for landscape photography any time of year. The autumn months provide breathtaking vistas of the beautiful brown and golden forests surrounding the mountain. Although I prefer the warmer weather in the spring and summer, if you’re willing to brave the cold mountain winds, a snowy scene can render a stunning image. Great landscape photography usually involves some degree of dedication, especially when attempting to capture a fantastic sunrise. Several visits to the same location are often required to capture the best skies. Unfortunately, Pilot Mountain maintains limited operational hours restricting access to the summit. March to November, the mountain opens at 7 a.m. and closes at sunset, and from December to February, the gate doesn’t open until 8 a.m. The good news is for those camping on the mountain; they will have access to the mountain well after sunset. But if you’re looking for a colorful sky over the summit, bear in mind, the sun will be at your back when shooting from Little Pinnacle. As for myself, I prefer the fabulous colors offered during the golden hours. I love an early morning sky. Fortunately, when I first visited Pilot Mountain the gate was open upon my arrival, around 6:20 a.m.; thus, I was able to ascend to the summit and set up my gear and get the shot. Captured at 7:42 a.m. on October 16th, 2016, sunrise was at 7:30 a.m. Weekends and holidays are filled with heavy traffic, large groups, and crowded parking. Of course, for many, weekends are the favorite times to visit Pilot Mountain. Like any popular attraction, one must patiently endure lines and busy restrooms. Having been to the mountain on both a weekend and weekday, especially in the spring and summer, expect a full parking lot while waiting in a long line that extends down the mountain. Remember, parking is limited so keep in mind, once you enter the 2-mile line ascending to the parking area, deciding to abort may not be an option. Once the traffic is backed up, opportunities to turn around are extremely limited if not impossible. It’s a long way to a restaurant. Regrettably, if you have a hankering for a tasty mountain breakfast, you’re not going to find it at Pilot Mountain. No vending machines or food of any kind are available on the mountain. Although one can venture out to the surrounding areas for a quick bite; however, the nearest restaurant is a few miles away. Also, don’t forget about the parking dilemma I mentioned earlier. Although I usually recommend a good pair of quality hiking shoes, depending on your intentions, one could get away with a pair of flip-flops. With that said, if your plan entails hitting a few trails or climbing to the summit, good shoes are a must! I recommend at least a good pair of tennis shoes. Nevertheless, one can never go wrong with a pair of hiking shoes or boots. Keep in mind, trekking with expensive photography gear is the main reason I wear hiking shoes. I have no desire to twist an ankle or take a chance on a fall. Go early morning and beat the crowd. Planning on an early arrival has its benefits. First, mornings are arguably the best part of the day and indeed the most beautiful. Second, it’s cooler in the summer; although it can be a cold mountain morning anytime so be prepared. Lastly, and probably the most important, you’ll most likely have your choice of parking, and you will not waste time waiting in a long line on the way up the mountain. I favor having a plan as opposed to chance; although, occasionally there’s nothing wrong with taking a chance. Nevertheless, I achieve better results with a little forethought and preparation. In my experience, a plan tends to help organize my thoughts, as well as keep me focused on my goals, rather than just snapping away. Click here to read my Philosophy. Although the restroom does have running water, I recommend bringing drinking water, not that there’s anything wrong with the water on the mountain. However, it does take a bit of time to ascend to the top of the mountain, find parking, then discover that the restroom is closed or has an issue with the water. Why leave it to chance. Further, if you plan to stick around awhile, pack snacks or plan a picnic, descending the mountain to a local restaurant will take quite a bit of time; depending on the time of day, you could have a long wait to get back up the mountain if you decide to return. Visit during the week if possible. If you have any choice in the matter, visit during the week. Not that a weekend is impossible to enjoy, but you can potentially have Pilot Mountain mostly all to yourself. Enjoy the plentiful parking and unobstructed views without the large crowds blocking your chance of capturing a grand vista. Of course, if you prefer more people around for security, a weekend may be a better option. Please take a moment and leave me a comment below. You may also benefit from visiting my Portfolio or Equipment Talk as well. This entry was posted in FEATURED IMAGE. © ScottymanPhoto 2016. All Rights Reserved.